Harry Potter Hogwarts Express (3rd Edition). 100% Complete set Includes All Minifgures and their accessories With Original Box With Original Instructions. This is the somewhat rare 3rd Edition Hogwarts Express, probably the most detailed of the Express editions. It was itinerised and then built and no pieces found missing. The set was used and so the odd brick does have a small dent, certainly nothing bad (ie chewed or heavily pitted) but ust from normal build/taking apart. There was very little in the way of dust and overall bricks are in a good, clean condition. All stickers have been applied and all still look good, couple of the wand case stickers I noticed were not 100% striaght when applied. Comes with a new/still sealed in packet Invisibility cloak, grey keys are still on spruce. The manuals are in a very decent used condition. They look and feel used with various creasing throughout from thumbing but there are no big page tears, loose pages or pen scribbles inside. So I feel the manuals are still pretty good. Comes with original box which has been beaten up a bit. Has various creases and and at some point had heavier items stored on it which caused the side to fold in. Various scuffing on edges and corners with loss of print across the front of the box - I would assume tape has torn the print away. Set was sellotaped up when not in use and still has sellotape at one end which is still sealed form it. Still does its job perfectly well of keeping all bricks safe in one place when not in use, and still looks impressive to look at. All your favourite Harry Potter characters in LEGO form. In the LEGO¨ Harry Potter Hogwart's Express set Ron and Harry borrow Mr Weasley's flying blue car and catch up with the Hogwarts Express, but something goes wrong. Harry's door opens and he is left hanging on as Ron steers the car overhead. Open the top of the passenger train to reveal Luna, Ginny and Draco and interior details. Includes train with removable roof, food trolley, luggage & Mr Weasley's blue car. Includes Harry, Ron, Luna, Ginny & Draco minifigures. This set includes Harry Potter, Ron Weasley, Ginny Weasley, Draco Malfoy, and Luna Lovegood minifigures, the flying Ford Anglia, candy trolley, invisibility cloak and three owls. Also includes the chocalte frog sweet that comes alive if it isn't eaten. Set has been completely taken apart and bagged according to the 2 manuals to assist the next owner. Will be posted inside another box to protect it in transit. Will be sent insured via tracked Courier. 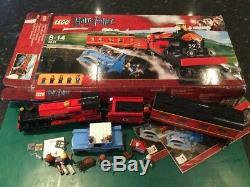 The item "Lego 4841 Harry Potter Hogwarts Express (3rd Ed) 100% Complete, Figs, Boxed" is in sale since Tuesday, January 23, 2018. This item is in the category "Toys & Games\Construction & Building Toys\LEGO Building Toys\LEGO Complete Sets & Packs". The seller is "tiggsandizzie" and is located in high wycombe, Buckinghamshire. This item can be shipped to United Kingdom, Antigua and barbuda, Austria, Belgium, Bulgaria, Croatia, Cyprus, Czech republic, Denmark, Estonia, Finland, France, Germany, Greece, Hungary, Ireland, Italy, Latvia, Lithuania, Luxembourg, Malta, Netherlands, Poland, Portugal, Romania, Slovakia, Slovenia, Spain, Sweden, Australia, United States, Canada, Japan, New Zealand, China, Hong Kong, Indonesia, Malaysia, Mexico, Singapore, South Korea, Switzerland, Taiwan, Thailand, Bangladesh, Belize, Bermuda, Bolivia, Barbados, Brunei darussalam, Cayman islands, Dominica, Egypt, Guernsey, Gibraltar, Guadeloupe, Grenada, French guiana, Iceland, Jersey, Jordan, Cambodia, Saint kitts and nevis, Saint lucia, Liechtenstein, Sri lanka, Macao, Monaco, Maldives, Montserrat, Martinique, Nicaragua, Oman, Pakistan, Paraguay, Reunion, Turks and caicos islands, Aruba, Saudi arabia, United arab emirates, Ukraine, Chile, Israel, Norway.